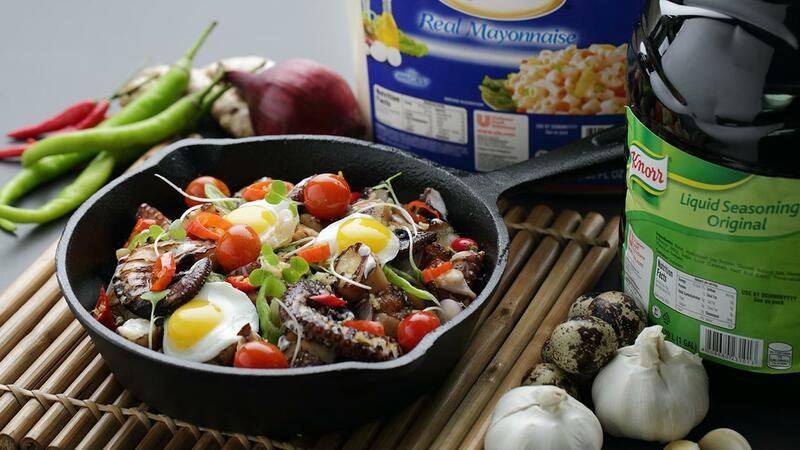 Elevate your diners' experience with this seafood twist to the classic Sisig! Roughly chop the grilled octopus then set aside. Add canola oil to a preheated pan and sauté grated ginger until fragrant. Add red onion and garlic, making sure not to overcook or burn them. Add bagoong alamang to octopus. Mix until well-combined. Pour in coconut milk and Knorr Liquid Seasoning. Add chili fingerand siling labuyo, then simmer for 2-3 minutes. Transfer octopus sisigonto the hot plate, then add raw quail eggs and cherry tomatoes. Sprinkle with spring onion and fried garlic. Garnish with ground chicharon and a side of dayap wedge and serve immediately.